Do you follow your favorite brands on social media? I bet you follow at least five. I probably follow at least fifty. And why do we do that? Well, personally, I’m a marketer and I’m curious about how other people market their business. But also because I want to know what they’re up to. What’s new. Who are the people behind those companies. To know when they have awesome offers I could take advantage of. There are tons of reasons why people follow brands. So you can assume, or better yet, know, that your clients want to follow you on social media. So... why not be there for them? This is the most straightforward reason why you should do social media marketing. Because your clients want you to. But SMM (social media marketing) is also a ton of work. So let’s see some other reasons why it’s worth it to have a social media strategy. Raises brand awareness - Brand awareness is a vital thing for brands, especially when they’re just starting out. If you have a startup, you should take advantage because social media is known to be the perfect medium to gain that awareness. Helps show your brand’s authenticity - You get to show your clients that you’re not just a company that wants to take their money, but a team of people with a vision and a desire to help them achieve their goals. Gathering data - Social media is the perfect place to have a conversation with your clients. This will help you better understand what their life is like, why they need your product or service and what you can do to improve their experience with your brand. Reputation management - Whether companies are there to hear it or not, people share their experiences with brands on social media every single day. And if you receive negative feedback, that can affect your brand’s image. If you’re there to respond and offer a solution, then that actually improves your reputation, turning you into a thoughtful brand that cares about customer satisfaction. Now that you know why it’s so important to be present on social media, let’s get into how you can create a social media strategy for a startup. Today we’re sharing with you a social media canvas that you can fill in as you’re following this article. Note: This is the fifth step in our Less is more digital marketing strategy, so be sure to check out our previous articles. Any good strategy starts out with a purpose, and this one is no exception. Without setting a goal to achieve, how would we ever measure the success of our efforts? So figure out what your overall goal is. Afterwards you can set specific objectives on shorter periods of time that will help you reach this higher goal. If you need some inspiration, Buffer has a great article on setting social media goals. You can choose one or more, depending on your business. Don’t forget to take in account what your business or marketing goals are and how this strategy can help you get closer to them. There are a ton of social media platforms out there, and being on all of them is not the answer. Firstly, because it would require a huge team managing all those accounts. And secondly, because your audience is probably not present on many social media websites. According to the study made by Global Web Index, an internet user has on average 7.6 social media accounts. Just think of how many accounts you have on social media - and then, which ones you’re actually active on. Businesses that want you to be their customer should only target you where you’re active. Same thing applies to your business and your clients. It’s all about knowing who your buyer is and what platforms they’re active on. In our first article of the series, that talks about how to develop a buyer persona, we also discussed “online behavior”. If you didn’t create a customer profile, you can look at what type of audiences each social media platform has and figure out where your clients would be spending their time the most. This Social Audience Guide from Spreadfast can help you out. The channels we’ll choose are Facebook, Instagram, Twitter and LinkedIn - because those are the social accounts where our buyer persona is active on. When defining your tone for creating social media content, you need to keep in mind the attributes of your voice and build on them. Think of the context. For instance, writing a blog article and posting on social media are two different things. While in a blog article you’re being informative, the content on social media should be more entertaining and eye-catching. Tone can be different from platform to platform as well. On LinkedIn companies tend to be more professional, while on Twitter or Instagram they usually take a more casual approach. Our tone of voice for social media will be friendly and inspiring, while offering information that is backed up by data - not presumptions. what should never be done. In the first category you can talk about how your posts should be like and what elements they should always have, whether you’re talking about always adding hashtags or keeping in line with your brand’s visual identity. In the second category you should write what the posts should never have, whether that’s jargon, bad quality photos or something else. If you want to go the extra mile, you can create an example of a great post and an example of a bad post. These guidelines will not only help you get a better feel of what your content should be like, but they will also help tremendously other people coming on board. We want our posts to be friendly so we’ll include emojis. For our visual content, we’ll keep in mind our visual identity. What should never be done is share content from suspicious websites or share bad quality photos or videos. Having social accounts as a business can be exhausting because it requires you to share content constantly and consistently. To avoid the “what to post today?” crisis, you need to create a content plan. If you decide beforehand what type of content you will share on social media, you will know what and when to post (plus: your audience will know what to expect from you). Ideally, you’ll share content from all of these four categories - but it’s okay if one or two just don’t work for you, as long as you can provide enough content for your audience. Let’s check them out one by one so you can figure out which will work for you. Let’s start with original content. This is content created by you. Personally, I think you should rely on this one the most - and you can see the benefits of that in our previous marketing article. Blogging is maybe the most popular type of original content businesses create - but you can also create images and videos, infographics, ebooks, polls, quizzes etc. Whatever works for your business. Next, we have curated content. This is content you collect from trustworthy brands that can provide value to your audience. Here is where you decide what type of brands you want to check out and what type of content you would want to share from them. Promotional content is represented by the posts you’ll create to promote your products or services. These are sort of frowned upon - and you should definitely not overdo it. Don’t post about your products daily because your audience will think you’re too salesy and dismiss you in the blink of an eye. However, occasional promotional posts have their purpose too - and including an offer might just convince your audience to buy. Lastly, we have user generated content. The most precious content of all - and the most difficult to procure as well. User generated content is exactly what it sounds like - it’s content that users create related to a brand. They can either post it on their social media accounts or send them directly to the brand. This type of content is amazing because you can share it on your social platforms. And there’s nothing that people trust more than other people’s opinion. According to MOZ, online reviews impact 67.7% of purchasing decisions. If your audience sees that other people are enjoying your products or services, then they’ll be more inclined to try them out as well. In this section you can think about the type of content that your clients would be willing to create and think about how you can persuade them to share their experience with your product or service (contests or offers work great). For original content, we’ll share blog articles about entrepreneurship that offer value to our audience and photos and videos with our team, to show our authenticity. For curated content, we’ll look for blog articles from trustworthy companies in our industry, as well as business statistics that could be helpful to our buyer persona. For promotional content we’ll share photos and videos with our business management tool with an attached offer to persuade the audience to sign up. Lastly, our user generated content will be with entrepreneurs running their business with the help of our tool. After you’ve established what types of content you’re going to share - you need to see how you can measure the content’s success. If something is not working out, don’t freak out. You learn by experience, especially in social media marketing. Measuring the success of your organic promotion will help you tweak your strategy in order to better suit your audience’s needs. The metrics are related to both the type of content you share and the purpose you’ve set. You can check out likes, comments and shares to see if people engage with your content - but also verify click through rate and revenue coming from social media to see if your purpose is being accomplished. The article we shared in the first step has recommendations of metrics for each goal they propose. The metrics we’ll use to establish our success are reach of our posts and referrals in Google Analytics to see how many people wanted to visit our website and/or buy our subscription after seeing our content on social media. Social listening (monitoring what people say about your brand) tools. Because we want to keep it short, we’ll leave you with an article from Neil Patel that talks more about tools for social media marketing. If you decide you want to use tools, we highly recommend researching multiple options to figure out what works best for you. For our visual content, we’ll use Adobe Illustrator and Adobe Photoshop. To check our grammar and spelling, we’ll use Grammarly. Finally, to create a posting calendar and to schedule posts we’ll use Google Sheets. And now we’ve come to the paid promotion part of social media marketing. Paid promotion is equally as important as organic promotion, and the two go hand in hand. The reason why people love social media advertising is because it’s highly targeted. Brands can target their ads exactly to the people that match their customer profile - the people that are most likely to purchase whatever the ad is selling. With the risk of sounding like a broken record, if you don’t have a buyer persona, this part is going to be quite difficult. If you have one already, then write down the age, gender and location of your customers. If you have any additional information that you’d like to target by, like education, job or interests, you can include them here. In the screenshots below you can see the types of information Facebook allows you to target by. Our buyer persona is male, with age between 25 and 40 years old. He lives in the United Kingdom and his job title is founder. After setting your objective, you can go ahead and set up a period of time when you want your ad to run and the budget it will run on. Experiment with different periods and budgets to figure out the best combination for you. Now, you can move on to defining the message that is going to convince your prospects to click on the ad. Depending on your overall purpose, on your set objective, your product or service and even your brand’s values - the message will be different. As people see more and more ads, they become immune to them and get used to quickly scrolling through ads. That’s why you need to stand out, give them a reason to stop and click on your ad. Don’t forget to check if your ad is providing value to your audience. This part is what makes or breaks your strategy. There’s not much else we can help you out with here - except tell you to give yourself plenty of time to research and brainstorm the best message for you. For some extra tips, check out what Facebook has to say. The objective of our ad is to generate conversions. The period when it will run is 1-30 October 2018 and the budget is of 200 US dollars. The message decided for the ad is “Focus your time on what you love. Let us handle the rest”. The CTA button will say “Sign up now”. Similar to the metrics you’ve set for your organic promotion, you need to set metrics for your paid promotion as well. It’s actually even easier to set metrics for ads. The metric you need to look at should be easy to figure out from your objective. If you’re looking for brand awareness, then reach and impressions should be your main focus. If you’re looking for traffic on your website, then you should check the click-through-rate on the ad and your referrals in Google Analytics. You get the gist. The metrics we’ll follow to figure out our ad’s success are the click through rate and referrals from social media in Google Analytics. Finding influencers in your field that can help you promote your product or service. Create a plan to respond to direct messages. As always, if you want to download the example too, you can do so here. 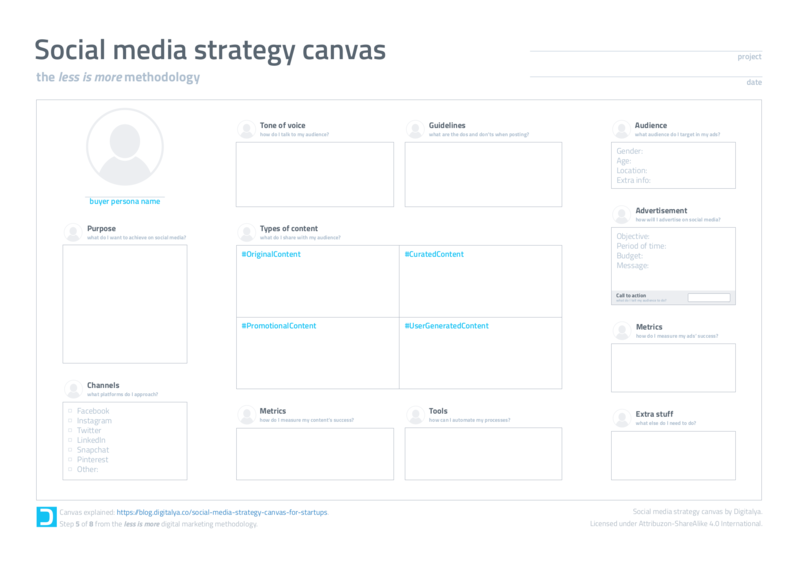 And there you have it: the guide to creating a social media strategy for startups! We hope you found the article useful and that you will use the canvas to create your social media plan. Don’t forget to check out our other articles and subscribe to our blog if you want to find out when we put out something new. Strategy canvas Marketing for startups.